The Shenzhou program (/ˈʃɛnˈdʒoʊ/, Chinese: 神舟) is a manned spaceflight initiative by China. The program put the first Chinese citizen, Yang Liwei, into orbit on 15 October 2003. Development began in 1992, under the name of Project 921-1. The Chinese National Manned Space Program was given the designation Project 921 with Project 921-1 as its first significant goal. The plan called for a manned launch in October 1999, prior to the new millennium. The first four unmanned test flights happened in 1999, 2001, and 2002. These were followed by 2 manned missions. The second one was launched on 12 October 2005. The Shenzhou missions were launched on the Long March 2F from the Jiuquan Satellite Launch Center. The command center of the mission is the Beijing Aerospace Command and Control Center. The China Manned Space Engineering Office provides engineering and administrative support for the manned Shenzhou missions. The name Shenzhou is variously translated as divine vessel, divine craft, or divine ship. China's first efforts at human spaceflight started in 1968 with a projected launch date of 1973. Although China did launch an unmanned satellite in 1970 and has maintained an active unmanned program since, the manned spaceflight program was cancelled due to lack of funds and political interest. Phase 1 would involve launch of two unmanned versions of the manned spacecraft, followed by the first Chinese manned spaceflight, by 2002. Phase 2 would run through 2007, and involve a series of flights to prove the technology, conduct rendezvous and docking operations in orbit, and operate an 8-ton spacelab using the basic spacecraft technology. Phase 3 would involve orbiting of a 20-ton space station in the 2010–2015 period, with crews being shuttled to it using the 8-ton manned spacecraft. The chief designers include Qi Faren and Wang Yongzhi. The first unmanned flight of the spacecraft was launched on 19 November 1999, after which Project 921-1 was renamed Shenzhou, a name reportedly chosen by Jiang Zemin. A series of three additional unmanned flights ensued. The Shenzhou reentry capsules used to date are 13 percent larger than Soyuz reentry capsules, and it is expected that later craft will be designed to carry a crew of four instead of Soyuz's three, although physical limitations on astronaut size, as experienced with earlier incarnations of Soyuz, will likely apply. The fifth launch, Shenzhou 5, was the first to carry a human (Yang Liwei) and occurred at 9:00 CST (UTC +8) on 15 October 2003. Like similar space programs in other nations, Shenzhou has raised some questions about whether China should spend money on launching people into space, arguing that these resources would be better directed elsewhere. Indeed, two earlier human spaceflight programs, one in the mid-1970s and the other in the 1980s, were cancelled because of expense. In response, several justifications have been offered in the Chinese media. One is that the long-term destiny of humanity lies in the exploration of space, and that China should not be left behind. Another is that such a program will catalyze the development of science and technology in China. Finally, it has been argued that the prestige resulting from this capability will increase China's stature in the world, in a similar manner to the 2008 Olympics. On 17 October 2005, following the success of Shenzhou 6, Chinese media officially stated that the cost of this flight was around US$110 million, and the gross cost of Project 921/1 in the past 11 years was US$2.3 billion. These values are lower than the cost of similar space programs in other nations. The Chinese media has heavily promoted the experiments undertaken by Shenzhou, particularly exposing seeds, including some from Taiwan, to zero gravity and radiation. Most scientists, however, discount the usefulness of this type of experiment. The experience during the 1960s of both the United States with the Manned Orbiting Laboratory and the Soviet Union with the Almaz space station suggests that the military usefulness of human spaceflight is quite limited and that practically all military uses of space are much more effectively performed by unmanned satellites. Thus while the Shenzhou orbital module could be used for military reconnaissance, there appears to be no military reason for incorporating such a system in a manned mission, as China could use purely unmanned satellites for these purposes. The Shenzhou spacecraft resembles the Russian Soyuz, although it is substantially larger. Unlike the Soyuz, it features a powered orbital module capable of autonomous flight. 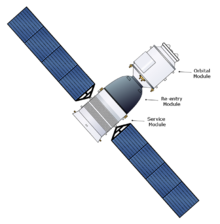 Like Soyuz, Shenzhou consists of three modules: a forward orbital module (轨道舱), a reentry capsule (返回舱) in the middle, and an aft service module (推进舱). This division is based on the principle of minimizing the amount of material to be returned to Earth. Anything placed in the orbital or service modules does not require heat shielding, and this greatly increases the space available in the spacecraft without increasing weight as much as it would need to be if those modules needed to withstand reentry. Shenzhou 2 9 January 2001 7 d 10 h 22 m 16 January 2001 N/A Carried scientific payload including monkey, dog, rabbit and other animals. Shenzhou 3 25 March 2002 6 d 18 h 51 m 1 April 2002 N/A Carried a test dummy. Shenzhou 4 29 December 2002 6 d 18 h 36 m 5 January 2003 N/A Carried a test dummy and several science experiments. Shenzhou 5 15 October 2003 21 h 22 m 45 s 15 October 2003 Yang Liwei First Chinese manned flight, 14 Earth orbits. Nie Haisheng Multiple days in space, 75 orbits. Jing Haipeng First three-person crew, first Chinese spacewalk. Shenzhou 8 31 October 2011 16 d 13 h 34 m 17 November 2011 N/A Unmanned mission, rendezvoused and docked with Tiangong-1. Liu Yang First Chinese woman in space; first repeated flight; first manned docking with Tiangong-1 space station, 18 June 2012, 06:07 UTC. Wang Yaping Second Chinese woman in space; second manned docking with Tiangong-1 space station. Chen Dong First manned docking with Tiangong-2 space station. Shenzhou 12 2020 CZ-2F JQSLC Originally intended to dock with Tiangong-3, the mission will instead dock with the core module of the Chinese large modular space station, according to a 13 August 2016 interview with Shenzhou chief designer Zhang Bonan. There were two astronaut trainers selected for Project 921. They trained at the Yuri Gagarin Cosmonauts Training Center in Russia. ^ "Shenzhou pronunciation". Dictionary.com. Retrieved 2015-04-25. ^ "China's Manned Space Program Takes the Stage at 26th National Space Symposium". The Space Foundation. 2010-04-10. Archived from the original on 2010-04-12. ^ "Expedition 7 Crew Members Welcome China to Space". NASA. 17 October 2003. Retrieved 17 August 2018. ^ Scuka, Daniel (26 March 2018). "Tiangong-1 frequently asked questions". ESA. Retrieved 17 August 2018. ^ "China's Shenzhou spacecraft – the "divine ship"". New Scientist. 12 October 2005. Retrieved 17 August 2018. ^ Jonathan Amos (18 June 2012). "Shenzhou-9 docks with Tiangong-1". BBC. Retrieved 21 June 2012. ^ "神舟十二号飞船(SZ-12)：对接2018年发射升空的空间站核心舱。 - China Spaceflight". "Shenzhou". Archived from the original on 13 October 2005. Retrieved 21 July 2005. "China's first astronaut revealed". BBC. 7 March 2003. "Brief history of Russian aid to Chinese space program". Archived from the original on 8 April 2007. Retrieved 7 June 2007. "Details on purchase of Soyuz descent capsule by China, Space.com". Archived from the original on 2 June 2008. Retrieved 7 June 2007. Wikimedia Commons has media related to Shenzhou.